Use 'TEXTUREPROPS 1 1 1 0' to make texture page B use mipmapping, support mapping outside the boundaries and disable colorkeying (no pure-black alpha testing). No matter what I do, the face will be invisible in-game. Tried this with both .bmp .png. Added face in the .w file, and mapped it to tracknamea.bmp. Yes, I have the lastest version of RVGL, and no, didn't use alpha/translucent flag on the image/face. Instant, it seems you don't have the Shader version activated? I've downloaded your testlevel, and tested it on my own. 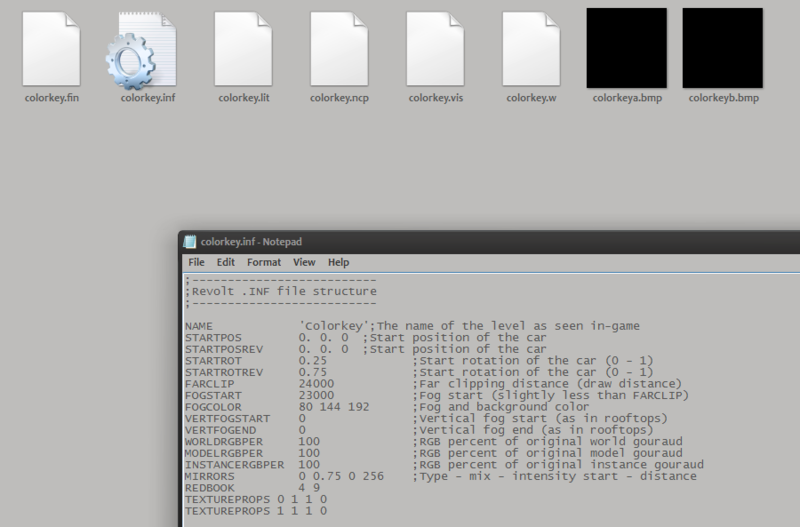 Without Shaders enabled, the colorkey setting in the level.inf-file seems to be ignored. Maybe this should be stated in the RVGL documentation. And this also means, that people who run a level who uses colorkeying without Shader-editions, will get a different experience. I also wasn't aware of this. Yes, the glitches in Makeitgood are also the reason, that I'm not using the Shader Edition by default. That's especially an issue when racing on tracks like Ranch, so the whole situation is kind of annoying. I thought I only can do it with the Shader = 0 or Shader = 1 line in the rvgl.ini. But this way it's much more comfortable, because I simply have to adjust my DEV shortcut. This is very useful, Thanks Marv. I think this is an oversight in the TEXTUREPROPS documentation. The colorkey attribute merely provides a hint to RVGL that the texture doesn't need colorkeying and hence it's safe to disable alpha testing. Alpha testing in shaders is a costly operation, so the game can make use of this information to conditionally enable it for textures that need it. There is however no guarantee that it actually gets disabled, and it currently only affects shader mode. If you really want pure-black pixels to stay opaque, you must save your texture as PNG or 32-bit bitmap, which will let you control precisely which parts should be transparent (effectively disabling colorkeying). 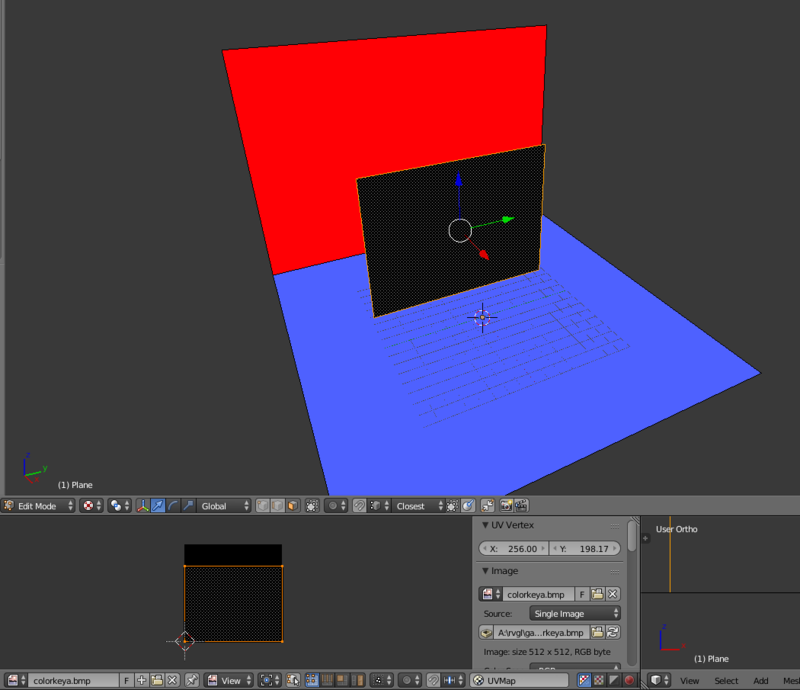 You could then set the TEXTUREPROPS values appropriately to benefit from the performance gains. The upcoming RVGL release should slightly change this behavior (allowing you to definitively disable pure-black colorkeying on 24-bit bitmaps), but the above information still holds in other cases. Also, the upcoming release should make shader renderer the default. See Huki's comment for solution - Also partly solved in 18.1020a.